The National Disability Insurance Scheme (NDIS) has a program for kids aged from 0-6 years old. It may look complicated but don’t worry, our team can guide you through the NDIS process. We want your child to get the support they need as early as possible, be it for their disability or developmental delay. The NDIS has a simple pathway to help you access the program. The NDIS program for children aged 0-6 is known as the Early Childhood Early Intervention (ECEI) approach. ECEI provides access to services for children with a developmental delay or disability. 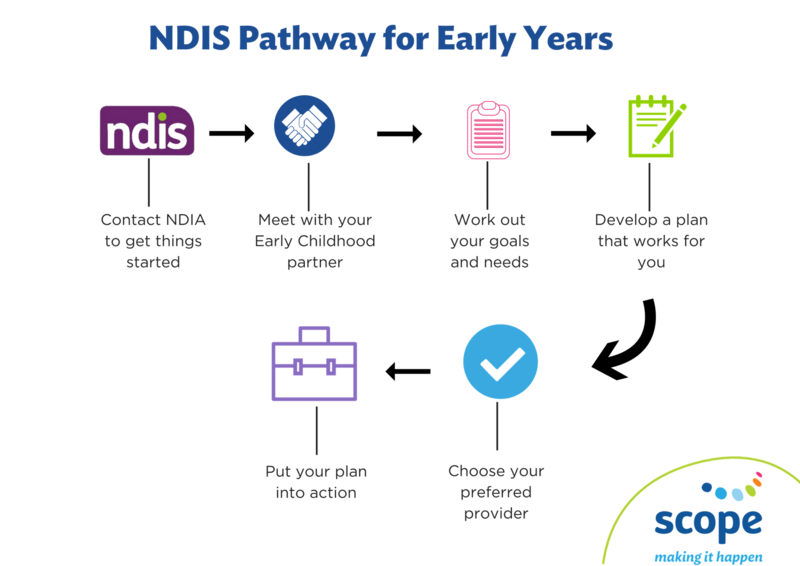 Here’s a quick overview of the NDIS Pathway for early intervention. Contact the National Disability Insurance Agency (NDIA): The NDIA gets the ball rolling for you. If you’re already getting assistance then you should receive information from the NDIA about the pathway you’ll need to follow to access the NDIS. Families and carers meet with an NDIS early childhood partner: The early childhood partner will get to know both you and your child, taking time to observe your child. Work out needs and goals: After spending time with your child, your early childhood partner will better understand the support and services your child needs to help reach their goals. Develop a plan for your child: Your NDIS early childhood partner will develop a support plan and submit it for approval. This plan outlines the services and support required for your child. It will also include some strategies and support for you and other people supporting your child. Choose your preferred provider: Research and shortlist your preferred service providers. Find out more about Scope’s specialist children’s therapy services. Put your plan into action: Scope will work with the NDIA to manage your plan including the funding needed to access services and support.